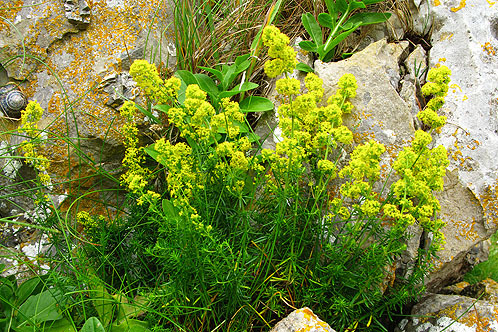 "Gallium Verum" , Lady's Bedstraw has small, narrow leaves that appear in whorls on its angular stems. The stems carry frothy heads of tiny, yellow flowers that appear in dense clusters ,so dense with flowers that they can carpet the grass with yellow from June to September. Dried, this flower has the scent of new-mown hay, and its name is probably derived from the tradition of stuffing straw mattresses with it, particularly those of women about to give birth.